Join your guide, Jay Gifford, on a tour of Pacific Heights with its colorful Victorian row houses, famous mansions, and beautiful gardens. Visit the inside of a period Queen Anne Victorian. See where Ms. Doubtfire and Princess Diaries were filmed, or where Robin Williams and Francis Ford Coppola lived. The walk is easy and there are no hills to climb. 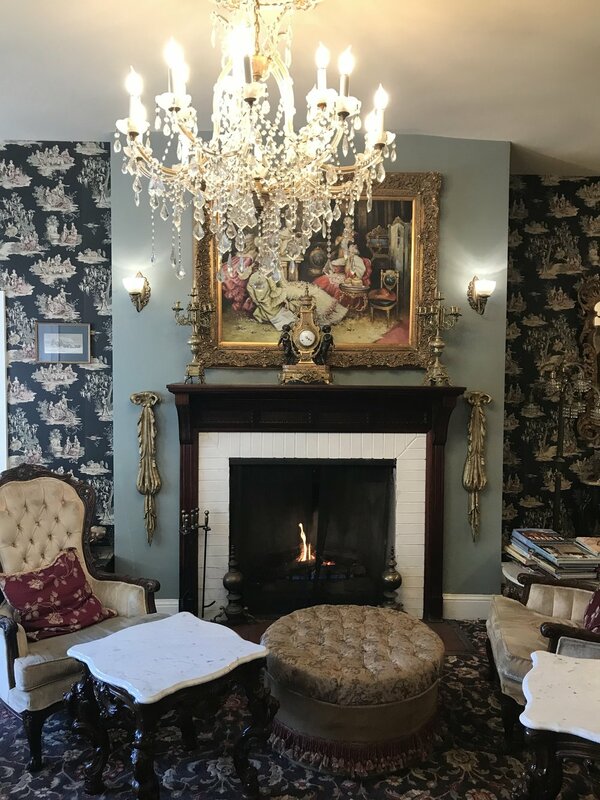 Enjoy lunch after the tour on Union Street, our exclusive Victorian commercial district, or return directly back to Union Square arriving around 1:30pm. The tour length is approximately 2.5 hours including one short bus ride with the cost and arrangement covered by your guide. Reservations are required for both the normal and private tours. Contact us for bookings. Last minute bookings are usually accommodated. Tours start from Union Square every Monday, Thursday, Friday and Saturday at 11AM, rain or shine at a rate of $25 per person (cash only). Private tours are available at the time of your choosing at a rate of $125 per couple. Patrons gather on Union Square at the CORNER of Powell and Post, across from Saks Fifth Avenue store. Your guide arrives 10:55AM with a yellow sign and departs 11:05AM. Contact us if you cannot find the group. No big buses are allowed on our tour route through Pacific Heights! Go where tour buses are prohibited, and learn about the real San Francisco from locals who live here! There are over 200 meticulously restored Victorians on the tour! Learn to appreciate the difference between Queen Anne, Italianate, and Stick-Style Victorians and the evolution of the city's architecture through time. the filming location for Anne Hathaway's scenes in "Princess Diaries"
Discover the homes owned by famous people including Robin Williams, Don Johnson, Francis Ford Coppola and many more! Walk past beautifully manicured gardens in the Pacific Heights neighborhood of San Francisco. Enjoy spactacular views of San Francisco Bay including Golden Gate Bridge and Alcatraz. Transportation to Victorian neighborhoods from Union Square is included! Jay has lived in San Francisco since 1979. 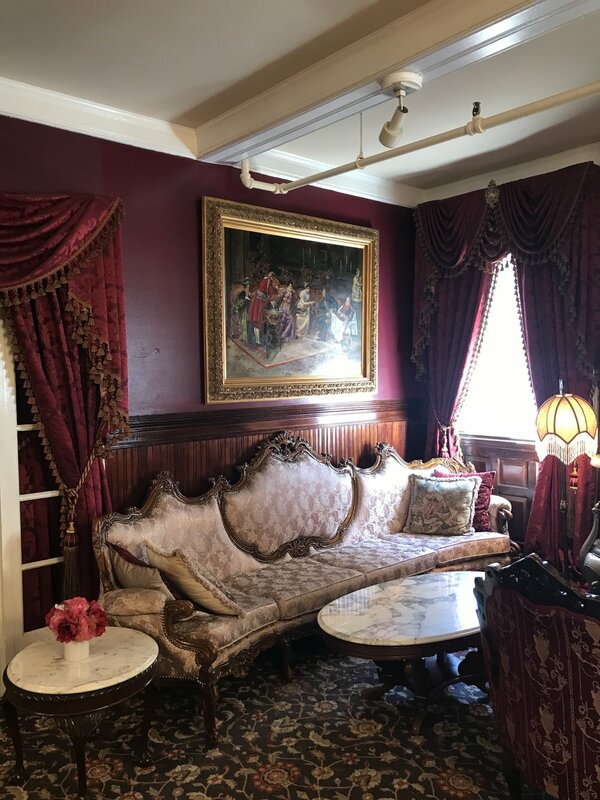 He worked for IBM for 15 years, purchased a Victorian in 1988, and lovingly restored it over the years to its original grandeur. Jay started the Victorian Home Walk in 1996, after being downsized from IBM, in order to share his enthusiasm and knowledge of Victorian homes. “As a resident of San Francisco for 38 years, I have a great passion for our city's trademark architecture, Victorians. The streets in our best Victorian neighborhoods are too narrow for tour buses, and as a result most visitors miss these local treasures. I created Victorian Home Walk to give people a chance to appreciate the Victorians the way San Francisco natives do, and to offer the seasoned traveler a tour "off the beaten path.” I am an active member of the San Francisco Travel Bureau, San Francisco Tour Guide Guild, IGLTA, The Victorian Alliance, and San Francisco Architectural Heritage” (Jay). The following are a select few reviews picked over the last two decades of our remarkable tour. In addition, checkout our reviews on Trip Advisor and yelp! This is one walking tour in San Francisco that you don't have to worry about the hills. It was quite a hot morning when we did this walk, but thoroughly enjoyed it. Being from the UK it was interesting to see the Victorian properties. Jay was very knowledgeable about the architecture and we had a visit to the Queen Anne Hotel which was a real eye opener of times gone by. We ended up in Union Street which was an ideal place to conclude the tour by having restaurants and coffee bars and it was so easy getting back to Union Square by bus. The tour was great! Jay was right on time, informative and gave us great details about the city and how they structures evolved over time. My husband, who hates Victorian homes, thought it was really interesting and cool. So for you couples out there--you guys don’t have to check your man card! Afterwards he told us where to eat and shop. Great tour for the money!! A relatively low key tour, there were only 15 in total on a Sunday morning tour. Jay arrived promptly, warmly greeted us, and laid out the entire tour for us. The walking is breezy with level streets and gentle slopes, that don't take their toll on your knees! True to his word, we saw the Golden Gate bridge and the Hollywood film locations among the Victorian homes. Jay was able to answer questions on demand, and was well versed in the architectural field. He was friendly without being invasive, courteous and approachable. The homes are so beautiful with intricate details and are hallmark features of San Francisco. My friend and I cannot think of a single thing Jay (our guide) could have done to improve the tour we took last Saturday. It was thorough without being dry. There was time for photo taking, question asking, and a little wall-sitting for this senior citizen. It was so interesting and enjoyable that even though the weather was getting mistier and mistier, no one seemed inclined to quit early. He did not disappear the minute the tour concluded, but made certain we knew how to locate return transportation and lunch. As a result ,we found a new (to us), fun part of the city to explore and had a super lunch at one of the restaurants he mentioned. He's a wonderful ambassador for a city he obviously loves. Totally enjoyed this tour a few weeks ago. Learned a lot about Victorians, and S Francisco. Tour guide was very knowledgeable, friendly, courteous. Tour was about 2 1/2 hours, nearly all flat walking, and worth every penny of the $25 charge. Highly recommended. Had a blast with our tour guide Jay. This was a fun historical tour that took us out of the tourist areas. I absolutely love Victorian Homes and was able to take about a hundred or more pictures. Saw the "Mrs.Doubtfire" house, as well as Jessica McClintock's. Saw some homes with windows designed by Frank Lloyd Wright, and lots of beautiful "Painted Ladies". Just wanted to say thank you for the great tour on September 24th. On Tuesday, September 16th, my wife and I took your Victorian Home Walk. It was a most enjoyable and informative time and one of the highlights of our stay in San Francisco. My wife has volunteered as a tour guide here in Wisconsin for 16 years and when she speaks well of a tour guide, it is high praise indeed! The pace was perfect and we simply cannot say enough about the quality of the experience. Thank you for offering such an enlightening perspective on this period of San Francisco architecture. We recently visited San Francisco and one of the highlights of our visit was the Victorian Tour walk. We live in a Victorian house in England and how much more colorful and fresh are those of San Francisco. It was fascinating to learn of the different styles of these Victorian houses and to be able to go inside one was the icing on the cake. Thank you for making the tour so interesting and so easy in terms of the amount of walking involved. We could hardly believe we had seen well over 100 Victorian houses in the course of our walk. We would certainly recommend this tour to any other visitors to San Francisco. I just wanted to express our appreciation for the wonderful tour we had last Sunday while vacationing in San Francisco. You may recall that at the end of the tour my husband, son and I wanted to go to Chinatown to eat lunch. You recommended House of Nan King and it was the best food we had the entire time in SF. The tour was most interesting too. My cousin and a friend are coming for vacation in the fall and I've already told them about your tour. You won't remember me but I have never forgotten your wonderful Victorian walk on my last vist to San Francisco. I cannot believe it has been 10 years! In fact, I went to your web site today and I see that my referral/testimony is still posted! That is flattering. I am returning to SF the last week of March and I will definitely do all I can to take the tour with you again. I see I don't need a reservation this time. I vacationed in San Francisco recently and participated in the Victorian Walk. It certainly was one of the highlights of my vacation. As I am showing my vacation photos (including photos of the Victorian homes), people are amazed that a tour is available to showcase this beautiful architecture. Thank you again so much. I am encouraging my friends, family and colleagues to check out the Victorian Walk Tour when they come to San Francisco. Just wanted to drop you a line and thank you for a wonderful tour this past Saturday. We really enjoyed the entire tour and the information you provided. It is very apparent that you absolutely enjoy what you do for a living. I noted that you developed this business when you were downsized in the 90's. This is the good news for the rest of us! Thanks for providing a wonderful view of SF. I wanted to let you know how much I enjoyed your walk last week (I was on the May 20th walk--the day you were videoed). Your knowledge & enthusiasm were perfect for the tour, and I really enjoyed seeing parts of the city that I have not seen before. Since I'm somewhat "star struck," I enjoyed seeing homes that have been featured in TV or movies, and seeing homes where celebrities lived. I also enjoyed the history lessons that you included ... especially learning about the fire wall along Van Ness during the 1906 earthquake. I wanted to write and let you know how much I enjoyed your walking tour. I took the tour with a group from Pricewaterhousecoopers on September 21st. Your love of your city and Victorian homes was very evident. As an East Coast resident and a first time visitor to San Francisco and never having paid much attention to Victorian architecture you made a great impression on me with your passion. Now having viewed your web page I wish we had taken your tour as you run it on a daily basis. Well maybe next time I'll get to experience that tour as well. Thank you for a very enjoyable day viewing your city. My friends and I had a wonderful time on Saturday on the Home Walk. We loved the Queen Anne and it was so interesting learning about the history of the Victorian home era and seeing and being able to identify the different styles. And you were right, we did have the neighborhoods to ourselves except for those people who lived there. We are bragging about our adventure to all of our friends!!!! I'm glad you decided to go into this full time. It was worth the drive from Fresno for the day!!!! We had a great time in July 1999, "Jay Gifford's Victorian Home Walk was a highlight of my trip. Yes, it is worth the money! He is engaging, patient, and a wealth of information. His angle is that he takes you to areas with hidden jewels that are less traveled by "the masses," and he delivers on that promise. He welcomes questions and seems to relish in sharing his love of the city with others. He points out things that one would not normally notice (the buses that are electric), and he appears to move at his group's pace instead of being a "stopwatch hound." Before he wrapped up, he took the time to help each person plot the best way to get to their next destination. What most impressed me -- we all reached for our wallets when he arrived, but he deferred; he doesn't collect until the end of the 2-hour walk. A touch of class and a sign that he is truly into to providing a service and not in it just to take your money." Thank you for a lovely tour. We have watched the video I made several times now. The homes still amaze me and you sound wonderful. The following day we wondered into North Beach and had lunch at Rose Pistola, which you had suggested when I found you at your web site. Again, thank you for enhancing our visit to San Francisco. From Moses and Floy T.
My wife and I were on the Saturday, 8/1/98 tour and we enjoyed it immensely. It was refreshing way to see and learn about a part of San Francisco history and current landscape. We also took advantage of some of Jay's suggestions for follow-up activities and enjoyed those also. The tour was everything it was advertised to be. I will recommend to my friends. From Brad and Michele Z. Seven members of our family and two friends were on your walk this past Saturday and we all had a WONDERFUL time. It was a great eye opener in to the history of the homes and San Francisco. We have already recommended your tour to friends here in Northern California and will heartily tout it when we return to our home in Southern California. Dear Jay, I just wanted to let you know how much I enjoyed your tour. I found it to be informative and the walk was just right, not too strenuous, but still a good bit of exercise. I am spreading the word to my friends and hopefully they will choose to participate in your tour. Thanks again for a time well spent. Just wanted to thank you again for the lovely walking tour. My mother in law who resides in the Bay area is raving to all her friends about the tour as well. We took your recommendation for the Italian restaurant (the name escapes me). It was also fantastic. If you expand your tour in anyway please keep us posted. You're a great tour leader and we loved your enthusiasm. I just wanted to tell you how much I enjoyed the "Homewalk" on June 19. My friend and I were impressed with your knowledge and the way the walk was laid out so we DID NOT HAVE TO WALK UP THE HILLS! Thanks for that especially. I will certainly recommend you to anyone I know who will be traveling to SF.... Again, thanks for making my visit to your beautiful city an enjoyable one. We recommend that you wear comfortable walking shoes, and bring a light weight sweatshirt or jacket. You may also want to bring a bottle of water or sunscreen as the weather can be unpredictable. I am not in great shape. Is this a difficult walk? This is an easy walking tour geared towards all abilities. 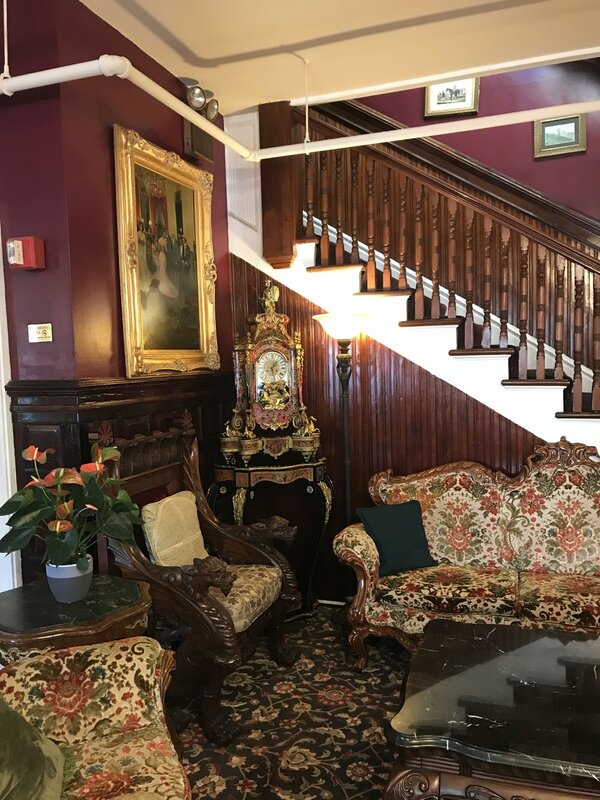 The tour is roughly 2 to 2.5 hours, but it includes the local bus ride, time to explore, time inside a Victorian, and many stops at different homes. No. There are no hills to climb, and the pace is leisurely. Yes, there is one restroom stop during the duration of the tour. What about lunch? Are there places to eat? You have the option to remain at Union Street in Cow Hollow when the tour ends right around 1-1:15. That area is full of great restaurants and shops. I have a question that hasn’t been answered? Don’t hesitate to contact us if we haven’t been able to properly answer any of your questions or concerns. Where can I buy snacks and water? There is a corner store at the beginning of the tour where water and snacks can be purchased. Don't hesitate to contact us for any unanswered questions, general inquiries and be sure to contact us to reserve your tour! We can be reached via text or telephone call at +1 (415) 252-9485 and via email at victorianwalk@yahoo.com.